This large, detached five-bedroom house is located in a very popular residential area close to Glasson Golf Club and the lovely village of Glasson. This fine family home has been built, fitted, and maintained to a high standard and will make an excellent home for its new purchaser. The house measures approximately 2,610 square feet, with additional storage of approximately 630 square feet, and it sits on a 0.575 acre site with lovely peaceful views of the surrounding countryside. The interior of the home offers five bedrooms, two reception rooms, six bathrooms, sun room, central heating, and attractive decor. The entire property is approximately 243 square metres with a BER B3 energy rating. It must be viewed to be fully appreciated. 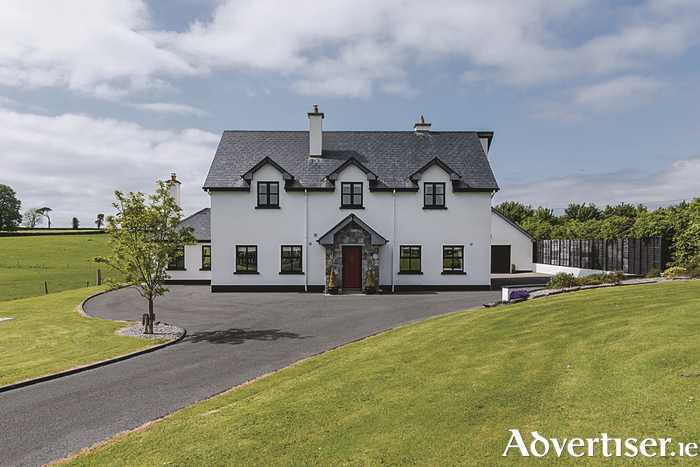 For more information call agent Dermot O’Meara of Sherry FitzGerald O’Meara on (086 ) 2551082.